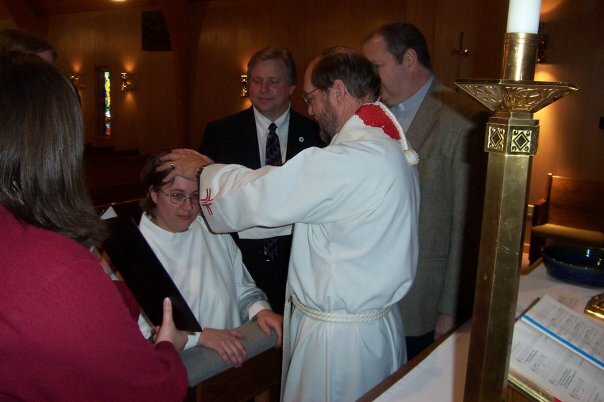 It’s a day that will always hold a special place in my heart…the day I was consecrated into the ministry of Word and Service; the day I was consecrated as a Diaconal Minister in the ELCA! 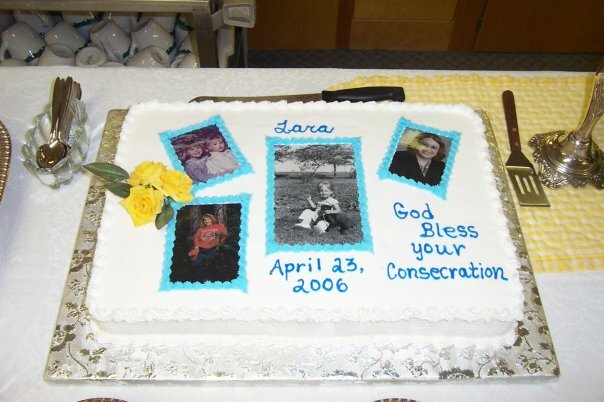 I can hardly believe that tomorrow April 23 will be the 6th anniversary of my consecration. It was such a blessed day; filled with family and friends. I am so glad that my friends Liz and Carrie drove through the night so they could be a part of this special day! The previous camp director of the camp I worked at preached a rockin’ sermon! A day that forever is a part of me and reminds me of my call to ministry! I remember so many laying their hands on me…what a powerful moment! 1. Do you use social connections, like Facebook, Twitter, Linked-in or whatever else there is? Describe how you use it/these. YES! Facebook has allowed me to stay connected with friends from all the different places/times in my life (Friends from seminary, from high school, college etc). It also has allowed me to stay connected with my family! I have a Twitter account but only recently have really begun to use it. Im learning from people who are much more adequate at it then I am. It is a great way to stay connected and meet new people. Linked-In has helped me keep colleagues, friends, etc and their contact info all in one place! 2. Do you text on your cell phone? Work, friends, family? Yep I text! I text friends! I text family! I even have texted colleagues sometimes! 3. Do you play any games? Which ones? Nope not really! I did at first but just too time consuming. 4. How do you predominantly use the various electronic devices you possess? To blog, read other blogs, to check email and to email, read my hometown newspaper, check Facebook etc! 5. How do you feel about blogging? Are you as involved in blogging as when you first started? What facilitates your blogging? I love blogging! I am as involved. In fact I would actually say Im more involved than I first was! I blog when Im inspired. I may be inspired by something I heard or read. I might be inspired by a friend’s blog! I might just need to write and so I blog! Bonus: Anything you want to add. You might like to discuss what helps you most in your vocation with internet connections. The Resurrection; Here and Now!! My cup is absolutely overflowing today!!!! I think so often it is simply so easy for life to get in the way! We get so caught up in the busyness of life that we can so easily see the darkness in our midst but we have a hard time seeing the light. This weekend has been absolutely full of light for me! Yesterday with about 500 other people, I witnessed new love…and new joy at the wedding of my friend Renee. Now some of you, my blog readers, know her story but others of you may not so I’ll give a quick snippet. Renee, Renee’s husband Ben and Ben’s cousin Jon were all in Haiti in January of 2010 when the earthquake hit! They were all seperated and Ben lost his life in the rubble. Ben spent his last moments of life singing! Over the course of the past two years, Renee and Jon have found their way to each other and formed a new love! This to me is light! This is the Resurrection in our midst; here and now! Then yesterday morning I met up with a good camp friend over Breakfast. As we were visiting, she was telling me about her foster child. She does “parent support” fostering. As many of you know, it is something I have been praying about and thinking about for a little while now! I couldnt help but smile and think about how smart the Holy Spirit is; showing me another opportunity. More light…more Resurrection in my midst here in now! Then later that afternoon, I Skyped my mom for the first time! So much fun to see the light in her as she saw me and got to talk to me at the same time! Perhaps the Resurrection in my midst yet again?!?! This morning I went with a good friend out to the church Renee serves at. We met up with another camp friend and her family who recently moved to town. The church is on the campus of the youth correctional center. We gathered with the boys and girls who are currently staying at YCC! I couldn’t help but wonder what their stories were! While at Heart River, I got to hear a dear Diaconal sister preach (She preached a rockin’ sermon that inspired this blog today! )More signs of light….more joy….more of the Resurrection in our midst here in now! The weekend isn’t even over yet. I will get to see college friends later this afternoon who I havent seen in forever! We are gathering for an adoption benefit for a college friend and her family who are adopting from Bulgaria! I am sure I will see more light…more joy today! Hard not to see the Resurrection in this Easter season as I look around this weekend yet it also is so easy like the gospel story we heard from Mark last week to be afraid, to let fear creep in, to doubt, and to see the darkness. May we spend more time always looking for the Resurrection in our midst! And in the midst of seeing the Resurrection, may your cups begin to overflow with love, joy, and countless blessings!! 1) Have you ever been on a mission trip, as a participant or adult chaperone? What was it like? I’ve done both…as a youth and as an adult leader (chaperone)! 2) What is the worst thing that happened to you/your group on a mission trip (or retreat, or camp, or Habitat for Humanity experience, or something like that–hey, this is YOUR Friday Five, so you get to play it how you would like.) WOW…I’ve got the story for you on this one. When I took a group to Biloxi Mississippi a few summers ago, we had quite the trip getting home! We got to the hotel to check-in and they told us our flight had already left. We were like what!?!?! Turns out the airline had changed our flight and never let anyone now…grrr!!! Luckily the airline paid for us to stay in a hotel for the night where the kids got to watch fireworks as they sat in the pool outside. We got up really early for the new flight they had confirmed us on! When we got there, it turned out our flight was an hour later so we crashed on the floor. Got into Atlanta and some kids were on one flight and the rest were on a later flight. What a mess! And we had youth who were trying to catch flights with family! So we were able to send a few youth and an adult leader on without the rest of us but the adult leader was on standby. So we filled out all the necesary paperwork, called parents, etc. At the last minute, the adult leader was able to get on the flight. The rest of us waited for our flight and it started thundering etc! So needless to say we were a little delayed too. Met a family who was flying to Mayo with their daughter so we prayed for them! Tammy the other adult leader and the three youth finally arrived in Minneapolis. However since Tammy was the parent, they wouldnt let her go with the youth who were minors and they wouldnt let the parents come up to get them so they were stuck between levels. Finally Tammy convinced the guy to let her go etc! We all eventually met up. Then we went to get our vehicles but we lost one of the parking permits so we had to show id and go through a bunch of hastle to finally leave! Stopped on the way home and got gas! Finally got back home and Tammy’s husband said do you have your id? And she was like yes! And he goes no you dont; the airport just called and you left it there. We figure she was so frazzled that she just left it! They had to send it to her! Quite the adventure home! 3) If money were no object, where would you want to go to help and serve? What would you do? So many places! I would love to go to India to our companion synod. I also would LOVE to go to Haiti!!! 4) What would be your advice to someone who will be sleeping in a gym with 20 other people for a week? Earplugs in case there are snorers, be respectful of others and they will respect you. I also think its important to know that not everyone operates the same way. On our trip, two different groups broke the rules and snuck out. When ours found out, they were like why did they break the rules and they felt left out? I felt bad for my youth but knew we had done the right thing! 5) Any parting thoughts, stories, or questions you have around the whole theme of Mission Trips? Nope not really! “How beautiful are the voices; how beautiful are the hands; How beautiful are the feet of those who bring Good News to the world!” These words caught me off guard tonight! I closed my sermon with them and found myself fighting back tears! I think it was all the faces looking back at me! I try to be a servant but Im also human! I don’t always think the best or nicest or act that way towards my neighbor ! I’m a sinner too but that’s the beauty Jesus doesn’t pass over anyone! He washes everyone’s feet! Tonight instead of a foot washing we did a blessing of our hands! So cool as I washed! Then one of my fave people saw me, grabbed my hands and washed them! I had to fight back the tears! Then I looked up and she was drying one hand while one of our elderly ladies was drying the other hand! A simple reminder to me and all of us!